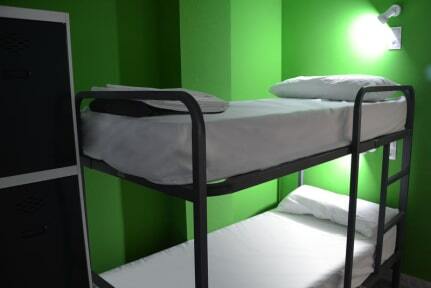 Motion Chueca is a brand new youth hostel located at Madrid's very city centre. Our hostel offers you bedrooms for 2 to 16 people with private bathrooms, buffet breakfast included in the price and a wide set of common areas and services. If you are looking for culture and entertainment, we also organize free city tours, flamenco shows, activities inside our bar, like our tapas workshops & tastings, and visits to Toledo, Avila and Segovia among others. The hostel is placed in the heart of Chueca in Madrid, located in the Plaza Pedro Zerolo, where you could enjoy of the best atmosphere. Besides, the transport system is perfect (Gran Via station, line 5 of Metro; and a bus station placed 3 minutes by walking from the hostel. Some rooms are shared and some others are privates. All of them have the bathroom inside the room and count on shared lockers or private closet and side table. All 2, 6, 8, 14 and 16 bedrooms feature private bathrooms, big windows with views to the city centre, air conditioning and heating, top quality beds, mattresses and bed linen and individual lockers. 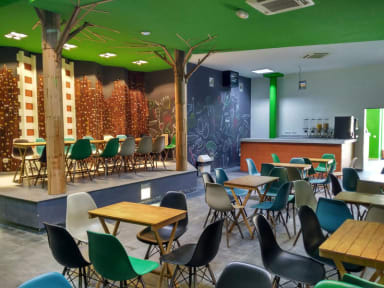 Enjoy our common areas and our free WiFi throughout the hostel, try our typical sangria and beer in the bar and meet new people at our lounge area. O hostel e bom, Bem localizado no coração de Madrid eu me hospedaria lá novamente sim. Obs: Poderia ao menos ter um micro-ondas para os hóspedes poder esquentar uma comida. Pequeno almoço fraco para o preço e não ter toalhas para WC. Limpeza ruim. Quarto pequeno. Água do banho gelada. Locker pequeno. Roupa de cama suja. É importante velarem pela qualidade dos vossos serviços, melhorando a higiene do local e apostando na modernização do espaço. Prestem especialmente atenção nas roupas de camas, pois estavam muita sujas.